The tale of two mothers conniving so that their children don’t further a romantic affair has been told many times. But place this same basic plot in the vibrant Indian suburb of Chatsworth in Durban, and you have a genuine story with character, flair and charisma. From the same producers that brought us Hard to Get (2014) and the very successful Happiness is a Four Letter Word (2016), comes the romantic comedy Keeping up with the Kandasamys. The movie tells the story of young love unfolding between Jodi (Mishqah Parthiephal) and Prinesh (Madhushan Singh), two fresh-out-of-school teens living next door to each other. 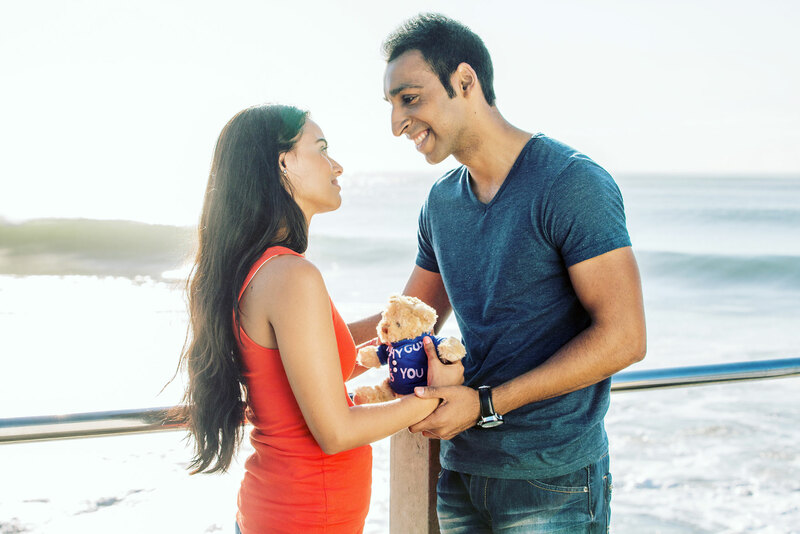 The moonlight and roses only lasts until their mothers, Shanti Naidoo (Maeshni Naicker) and Jennifer Kandasamy (Jailoshini Naidoo) find out about the relationship. Shanti and Jennifer have had a long-standing rivalry and can’t bear the thought of their children being romantically involved, never mind marrying one day. So in order to put an end to their love intentions, the two mothers set out to scheme and plot together in order to keep their kids apart. The consequences are comical and charming, with an interesting twist. The relatively unknown writer and director, Jayan Moodley, generally did a good job in writing a funny, engaging and heart-warming story that the whole family can enjoy. Expect a healthy blend of slapstick comedy, one-liner rib-ticklers and brilliantly sculpted characters. It is also her debut film. However, the dialogue seemed more natural in some places than in others, but that could also point to some of the actors who were a better fit than others in their roles. The two mothers played by Naicker and Naidoo are the real stars of the film and deserve all the credit that comes their way. With their respective extensive careers in the film and entertainment industry, it’s easy to see how they took on their roles with so much ease and expertise. Their comic timing and character chemistry are also noteworthy. Unfortunately not the same can be said about Parthiephal and Singh’s character portrayals in the movie. I was not once touched by emotion seeing them act out their romantic scenes together as a supposed couple. Their scenes together came across as static and forced and lacked chemistry and emotion. This could point back to the director who should have guided them more meticulously, as I’m sure they are talented actors; it’s just a pity this wasn’t showcased on screen. An array of vibrant side characters are used to colour the story in, really making Keeping up with the Kandasamys worth your watch. 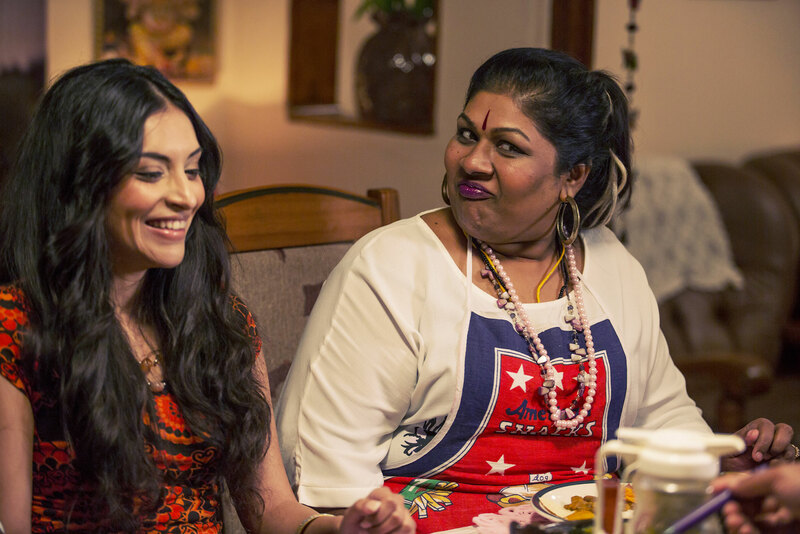 Look out for Prinesh’s little brother who barely says a word but has dazzling physical comedy moments, Jodi’s grandmother Aya (Mariam Bassa) who plays the typical know-it-all Indian granny who always meddles in everyone’s lives, Jodi’s ex-boyfriend and the DJ. These characters will have you roaring with laughter and bring out the best of the movie’s humour. The two rival women’s husbands, Preggie (Rajesh Gopie) and Elvis (Koobeshen Naidoo) are also key characters although they only have a little bit of screen time. The movie’s setting is the icing on the cake. Similarly historic and iconic as places like Soweto and District Six, Chatsworth as the movie’s backdrop opens people’s eyes to the lifestyle and culture of modern-day Indian South Africans. The film captures the true heart and soul of Chatsworth and manages to let the audience feel a part of the lively spirit of this unique suburb. The clever cinematography deserves a special mention here, as the bright colours and images enhance the watching experience. Keeping up with the Kandasamys truly has something for everyone to enjoy. Universal themes like neighbourhood rivalry and the desperate need for societal success will strike a chord with many an audience member and the humour throughout will make sure you keep on smiling in your seat. And then the ultimate question remains: Will love prevail or will the power of the motherly hand overrule? Keeping up with the Kandasamys releases today. Dee is a Jack of many trades and perhaps a master of some: writing, MC’ing, presenting, acting and the occasional afternoon nap. Dee is a Jack of many trades and perhaps a master of some: writing, MC'ing, presenting, acting and the occasional afternoon nap.